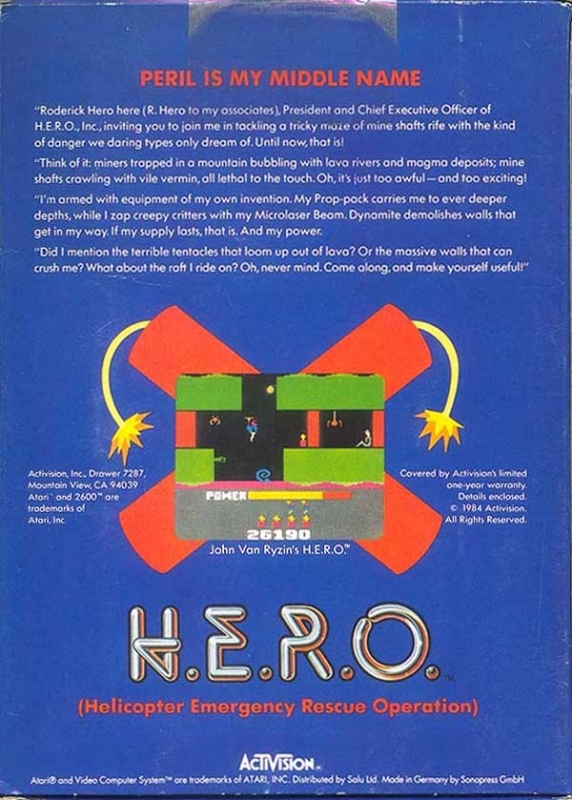 Roderick Hero here (R. Hero to my associates), President and Chief Executive Officer of H.E.R.O., Inc., inviting you to join me in tackling a tricky maze of mine shafts rife with the kind of danger we daring types only dream of. Until now, that is! Think of it: miners trapped in a mountain bubbling with lava rivers and magma deposits; mine shafts crawling with vile vermin, all lethal to the touch. Oh, it's just too awful - and too exciting! Did I mention the terrible tentacles that loom up out of lava? Or the massive walls that can crush me? What about the raft I ride on? Oh, never mind. Come along, and make yourself useful!